​Interested in becoming a CBW leader? Apply today or email us at columbusbwing@gmail.com for more information! ​Kayla began her babywearing journey in 2015 with the birth of her daughter. She saw a few moms wearing wraps at various stores while she was pregnant, and knew she had to have one too! Kayla started with a Moby, but quickly moved onto wovens when she joined CBW’s facebook group and saw how beautiful wraps could be! Now her toddler mostly enjoys the roominess and quickness of SSC’s, but she still cherishes those rare times when wrapping is an option. Kayla works full time as a speech language pathologist in the Reynoldsburg School District and enjoys her time training a fluffy puppy and working towards being more minimalistic and mindful in her everyday life. ​Meghan began her babywearing research months before her son’s arrival, organizing what options she anticipated being successful for both herself and her husband. She began wearing with a stretchy wrap and ring sling shortly after Eli’s birth, and has experimented with every type of carrier she could! She favors wraps and ring slings. Babywearing was crucial for Meghan - it was how she functioned on maternity leave, and it provided closeness with Eli after returning to work. This has led to a strong desire to help others find support in babywearing. Meghan works full time as a research project manager while slowly completing her MBA and MS. In her spare time, she renovates her money-pit of a house, chases the dog, volunteers, and spends way too much time on Facebook. Joanna started babywearing two and a half years ago, when her son was born. She didn't know much when she started out, but through CBW she and her husband learned about the joys of babywearing! Joanna fights an uphill battle convincing her toddler to go up these days, but when he lets her she uses her short wrap and SSC equally. Her husband loves to take their son on adventures while wearing him in the hiking back pack. Joanna teaches full time at the Graham Expeditionary Middle School. In her free time she reads books and makes quilts. She loves helping other mamas find the babywearing love! Beth began her babywearing journey with a Baby Bjorn with her oldest in 2011. With the arrival of her younger daughter in 2015, Beth discovered her love for woven wraps. She also has experience carrying her daughters in a stretchy wrap and ring sling. On a typical day, Beth will turn to either a ring sling or shorter woven wrap to keep her littlest close while getting on with life! Beth was attracted to the babywearing community for the valuable relationships that can be found. She understands parenthood is difficult and can become lonely, but the babywearing community allowed her to meet like-minded parents who share her passion for babywearing. She felt so supported by the babywearing community, it inspired her to give back and become a leader with Columbus Babywearing. Beth feels strongly about making sure new babywearers feel as supported as she did. Beth is also a Daisy Troop Leader and Peewee Pep Squad coach whose hobbies include mimosas and cinnamon rolls! ​Emma started babywearing when her first was born in 2011. As a non-driver, wearing was an important way for her to be independent, without needing to wrangle a stroller around the city. By the time her second was born, babywearing was a way of life. She loves the beauty and versatility of woven wraps, but appreciates the speed and convenience of buckles with her increasingly opinionated todder. Emma also admins the Facebook group Everyday Babywearing. 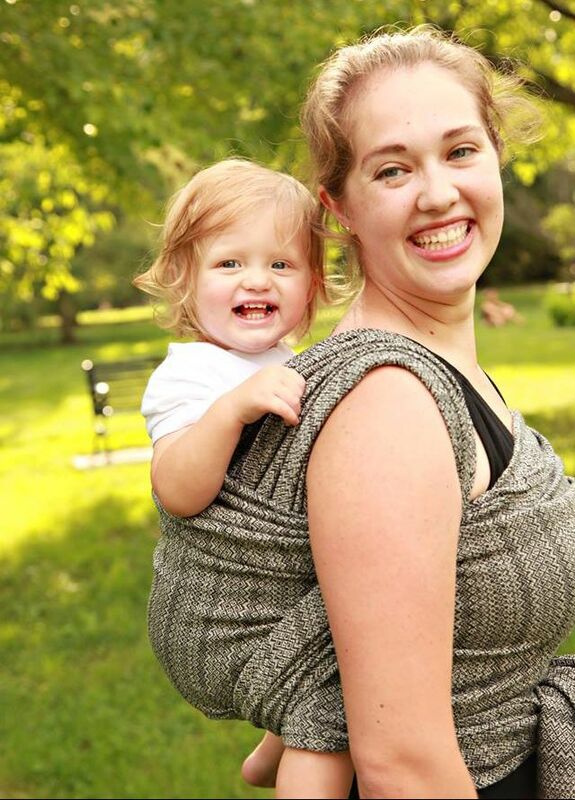 ​Brooke first began her babywearing journey in December 2014 with the birth of her daughter. She started with a stretchy wrap, SSC and ring sling. 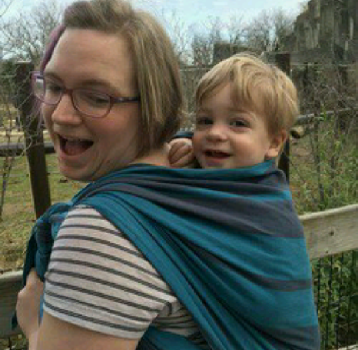 Brooke was later introduced to Columbus Babywearing and woven wraps in January 2015. Although fewer days are spent wearing her toddler, Brooke looks forward to more wearing days in the near future with the arrival of another child in September 2017. Prior to being a stay-at-home mom, Brooke taught special needs preschool. In addition to volunteering for CBW, Brooke volunteers for two additional non-profit organizations, stays active with cycling and kayaking, and enjoys spending time outdoors with her family. ​Stacie's mom has got it goin' on... she was babywearing in a metal frame carrier back in the 80's! Stacie always knew she wanted to babywear also, but didn't know how widely varied the products on the market were. She loves to try new things, but her favorite carriers are onbuhimos (waistless Asian styled soft structured carriers) and woven wraps. Outside of CBW, Stacie is a full time elementary special education teacher. She enjoys working with anyone who wants to learn how to babywear so that they become more confident with the carrier they chose and in their caregiving abilities. Bethany is a stay at home mom to two amazing kids with a third on the way. She was briefly introduced to babywearing with her first child, but didn’t find CBW until her second was born and wore him all the time from birth. She loves the convenience, freedom, and closeness that wearing allows. Bethany’s main role in CBW is keeping up with the wide variety of SSC's so she can teach them at meetings and help train new leaders. She loves to get out of the house with the kids and looks forward to wearing a newborn again on their adventures. They enjoy going to libraries, the conservatory, play cafes, and getting outside to explore different creeks and metro parks in the summer. Hannah knew she wanted to babywear when her college parenting class professor highly recommended the practice. As a worn baby herself, it seemed like a natural part of parenting. After a longer than expected wait to start her family and fertility treatments, the practice was even more appealing. Little did she know it would be her lifeline after giving birth. She believes babywearing was critical in helping with anxiety and new mom emotions as it gave her the confidence and hands free ability to function like a person. Now her toddler mostly gets rides for errands and disc golf but the confidence and empowering feeling will last past the last day of uppies.The empowerment of birth, breastfeeding and babywearing is important to her. The values of babywearing is something she hopes more families and caregivers are able to enjoy. Jessica discovered babywearing after the birth of her second child in 2014. She immediately fell in love with the closeness and connection that wearing provided to her son. And, it quickly become an essential part of their daily routine allowing her to keep up with a very active big sister. She started with a stretchy wrap and soon transitioned to SSC’s and wovens. Just as her wearing days were winding down, Jessica welcomed her third child and is excited to be wearing again on a daily basis. In addition to volunteering for CBW, Jessica owns and manages a yoga studio, serves as director for another non-profit that she started with her husband, and stays home full-time with their three kids. 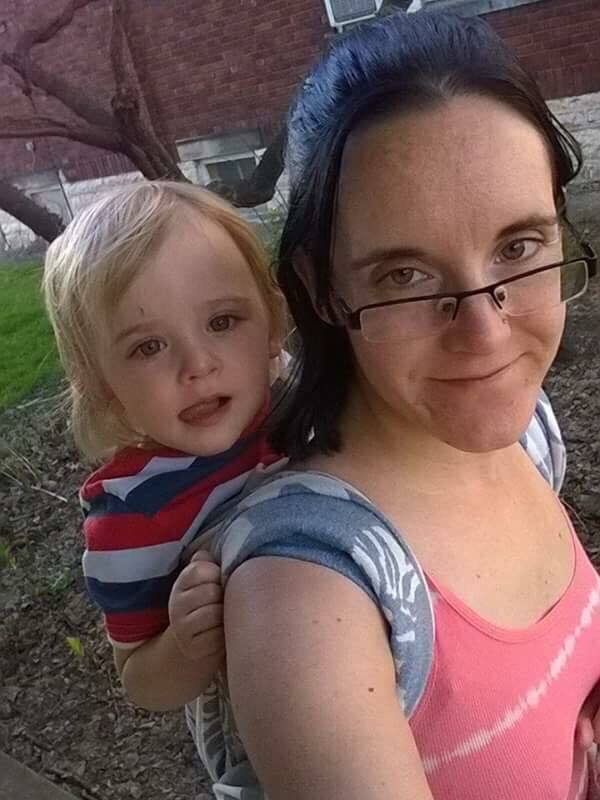 Kim started babywearing shortly after having her son in 2016. She first started out with a gifted moby wrap and a secondhand Ergo. While at a local moms group gathering she met another CBW member who graciously showed her how to wear her son in the Moby and told her about CBW. After attending Skills Workshops and Meetups and discovering how much she loved the closeness of babywearing, she decided to apply to be a CBW leader. Kim has come to love all types of carriers and enjoys having a variety of options to carry her son. Before becoming a stay at home mom, Kim worked as a Radiation Therapist at OhioHealth. She is also looking forward to welcoming their second child in Jan. 2018 and getting to wear another baby. Her free time is spent with family and friends, enjoying outdoor activities, and anything crafty. Lauren began babywearing with the birth of her daughter in 2013. After discovering CBW, her eyes were opened to the wide world of babywearing beyond her Baby Bjorn and Moby! 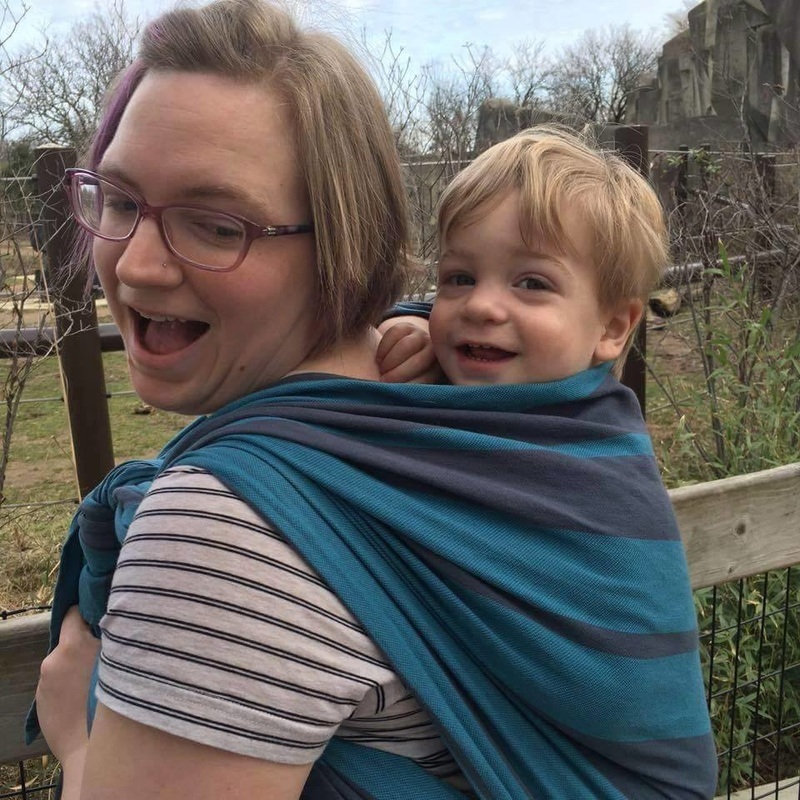 With her son’s arrival in 2016, babywearing became invaluable as it allowed her to have both hands free to keep up with the needs of both her children. Lauren has experimented with many different carriers but prefers wrapping and ring slings. Her favorite parts of being involved with CBW are the opportunity to educate other caregivers, snuggling tiny babies at workshops and being a part of a such a large and supportive community. Lauren works full time for a local finance company and in her free time, she enjoys football, anything nerdy, bad TV and crafting. Jamie began wearing her daughter shortly after she was born in January 2017. She immediately fell in love with babywearing because it allowed her to cuddle with her baby while getting out of the house to go on walks. She used SSCs for the first few months but became curious about other carriers after becoming more active in the CBW online community. After attending a few skills workshops and other events, Jamie developed a desire to learn about all kinds of carrier types. 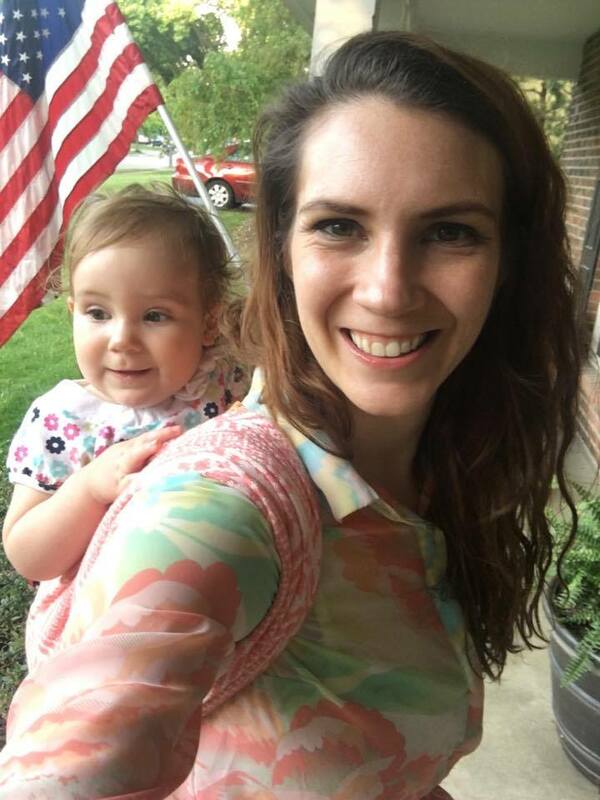 Coming from a teaching background, she thought she would enjoy helping others learn to wear their babies safely and comfortably as well, so she decided to apply to become a leader. Her love of babywearing has grown over the past year, and helped her to understand and take ownership of her role as a mother. Her favorite carriers for convenience are SSCs and onbuhimos, but woven wraps give the best snuggles. Outside of CBW, Jamie is a stay at home mom. She enjoys spending quality time with family and friends, reading, going to craft breweries, and being outdoors. Jessi found the babywearing love with her daughter who was born in March 2012. Quickly realizing that wearing gave her a closeness that she knew she would cherish as a working mother, she enjoyed every snuggle. She began her journey with a single stretchy wrap. When baby became too big and heavy for this type of carrier, she began to try out and fall in love with other types of carriers. 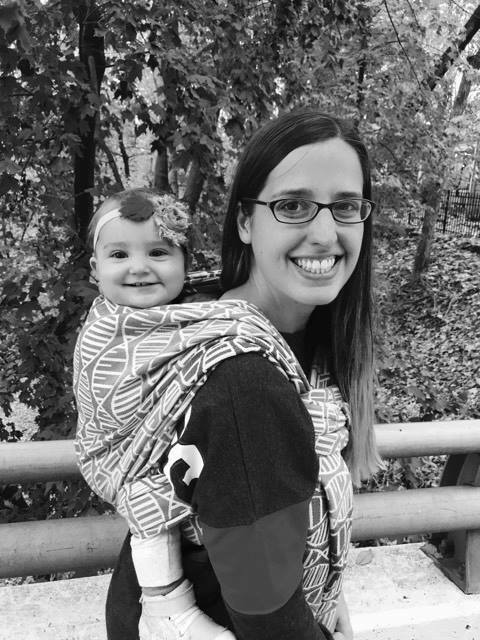 After her son was born in January 2017, and attending several CBW events, she realized that she wanted to join the CBW team and share the love of babywearing with other caregivers. Over the past few months, she has enjoyed meeting other CBW members and helping them find a perfect carrier for their needs. Her favorite carriers are the meh dai and SSCs but enjoys the versatility of woven wraps. Outside of CBW, Jessi is a middle school math teacher. She is passionate about birth rights for women. In her free time, she loves to dance, scrapbook, bullet journal, and be outside with her family. Meg began babywearing when her daughter was born the Fall of 2016. She loved how her stretchy wrap gave her the freedom to move while still providing comfort and closeness. While chatting with a babywearing friend from college it was suggested that Meg reach out to any local Babywearing groups. Enter Columbus Babywearing! Meg loves the support, community and education that CBW provides. In her free time Meg enjoys exploring local parks, cooking and gardening with her husband and daughter. Jessie started babywearing with her youngest sister (there’s a 13-year age gap). When she became a mom, her mom said the most important baby shower gifts are a carseat and a babycarrier. Her mom bought her first ring sling for her first child, Kaden. With a Velcro baby, babywearing was powerful parenting tool and as Kaden grew she moved into other carrier types. Jessie actively joined CBW after her second child, Audrey. Jessie works full time as a land development civil engineer. In her spare time she enjoys hiking and doing outdoor activities with her family. Ashley is a stay at home mother of four who began her babywearing journey in 2006 when her oldest daughter was born. She wore her daughter in a hand-me-down narrow based carrier and fell in love with the closeness and bond that babywearing helped create for them. 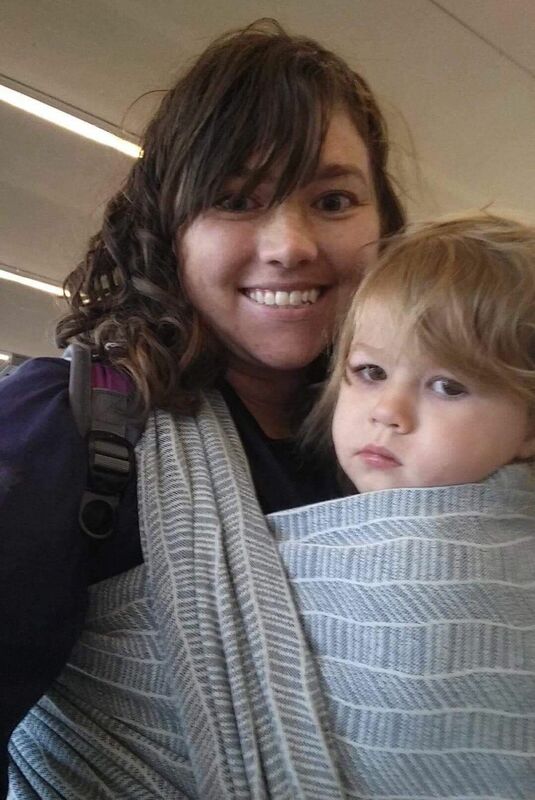 Having four children now, she has explored every carrier type she has been able to get her hands on, but primarily uses woven wraps for their comfort and versatility with meh dais being a close second. Babywearing has become a key part of her daily routine and helps her feel more confident and successful as a mother. She strongly feels that babywearing is an indispensible parenting tool and wishes that every new parent would have access to a safe and comfortable carrier for their children and has helped many of her friends and family members find the joy of wearing their own children close. Joining CBW leadership seemed like a natural next step to continue spreading the love for babywearing. In her fleeting spare time, she enjoys playing disc golf with her family, sewing, cooking, reading, and trying to keep current on her favorite shows. Amy has been babywearing since early 2016 when her first born was 2 weeks old. Putting on that ring sling to make some brownies opened up a whole new world of hands free snuggles. She loves to use many different carriers but right now with her 2.5yr old she uses ring slings and SSC typically. Amy is excited for her new baby in November to perfect fancy finishes and new carries with woven wraps and meh dais. She is still consistently wearing her toddler while in her 3rd trimester. She lives with her husband of 7 years and their toddler in Galloway. She loves spending time with her two dogs playing outside. They all love to travel and enjoy the versatility that carriers allow for bringing the toddler on long hikes. Colleen researched babywearing when expecting her first child in 2013 and found CBW. 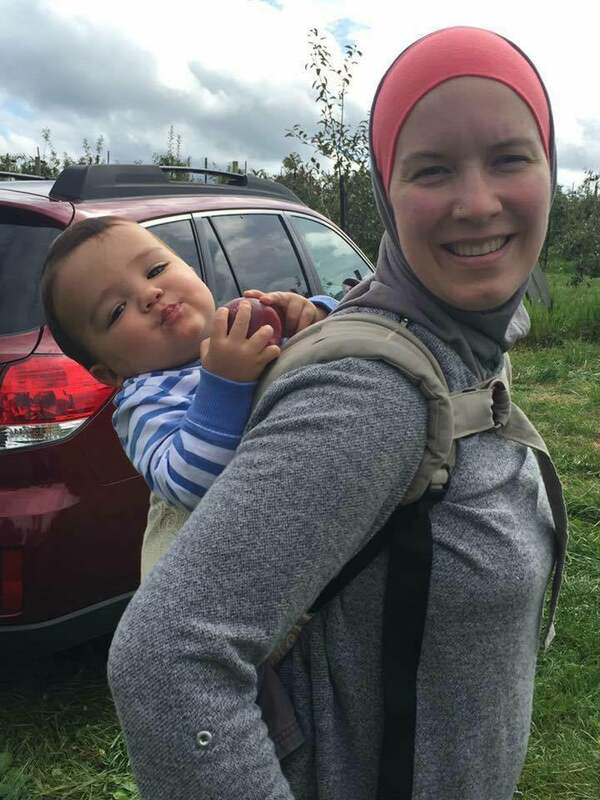 She started her babywearing journey with a moby and ergo. Five years later and two more children, Colleen still uses carriers in her day to day life. She has tried them all and loves each type for different reasons and chooses depending on where they are wearing. Colleen prefers meh dais, buckles, and onbuhimos. After coming to Meet Ups she enjoyed the atmosphere of CBW and decided to join CBW leadership team. When she is not chasing toddlers or working with CBW projects she enjoys reading, crocheting, hiking, and camping with her family. Caitlin is a stay at home mom that started babywearing after having her daughter in February 2016 however it wasn’t until April 2016 that she discovered CBW. Having had a preemie, babywearing gave her independence while out of the house without the worry of up close encounters of others during the winter months. She started with an Infantino brand SSC and later ventured to other types of carriers. Now having two children, babywearing still plays an important part in her everyday life. Becoming a leader with CBW has always been on her mind, after enjoying CBW events and what CBW has to offer, she decided to apply. She lives with her husband Justin and their two daughters Evelyn and Eleanor in Grove City. In her spare time, she likes to travel and the occasional wine tasting date night. Mandy discovered baby wearing through leader and family friend, Emma Wade. Mandy first learned to babywear to help a friend keep up with her own older kids after having a new baby. Mandy knew that when she had her own, she would definitely want babywearing in her parenting toolbox as well. With the birth of her daughter in October 2017, Mandy started babywearing daily. Mandy loved the community of parents she found in Columbus Babywearing and felt so much appreciation for the help and resources they provide that she just had to be a part of it. Mandy prefers woven wraps but is eager to try anything and everything! She is a former NICU nurse and current stay at home mom and in her free time she enjoys crafting, hanging out with her dog, and board games.